On April 7th 2018, Zags and the Spokane Community got together to make a difference for the kids at Sacred Heart. 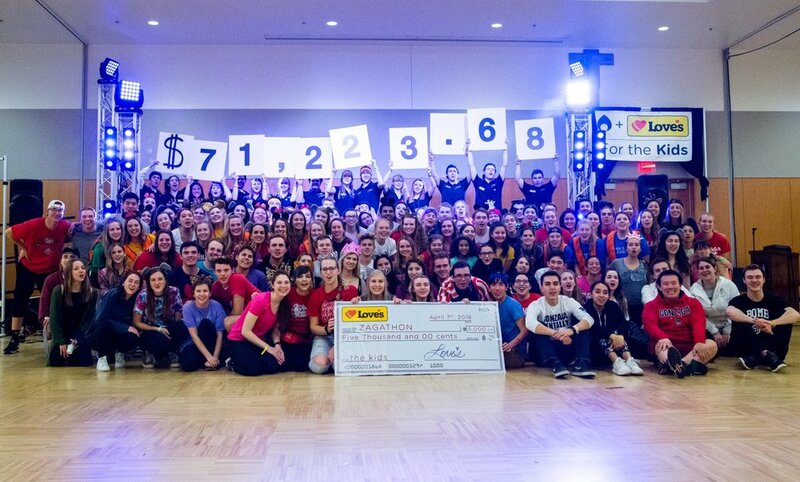 For 8 hours, dancers stayed on their feet and pushed to raise as much money as possible. At midnight, our Executive Board revealed that we raised $71,223.68 for the kids and we couldn't be prouder of our team! From 4pm-12am, dancers tore up the Hemmingson Ballroom with some killer dance moves and incredible energy. Each hour, Zagathon had different themes to dress up and dance to like Zag hour, Around the World Hour, Superhero Hour, Disney Hour, Throwback Hour, and Animal Hour. The night was full of visitors and live performances that lit up the night including Zumba instructors, K-Pop Club, Dance Team, Bomb Squad, and lip sync battles. Most importantly, we were able to share this incredible night with some very special guests. Miracle kids and families from Sacred Heart told us powerful stories of their experiences in the hospital. Some were stories of loss, some were stories of life, but all were stories of hope and love. At the end of the night, every Zag in the building was dancing for something bigger than themselves. They were dancing for the kids that couldn't. A huge thank you to everyone who came out and supported Zagathon in April. We are so grateful and we couldn't do this without you. Older PostZagathon Hosts First Annual Gala For the Kids!